Before Derek's 4th birthday in August, I stood in the middle of our messy, overflowing playroom and determined that I needed to put a little more thought into his birthday gifts lest I be swallowed up by one more piece of plastic that would be tossed aside and forgotten within weeks. We found a couple of toys that really worked out well, and still get used consistently. I thought I would share some with you in case you are looking for good gift ideas for the little people in your life. Pat the Bunny sent this set to Derek, and it is a really cool toy. 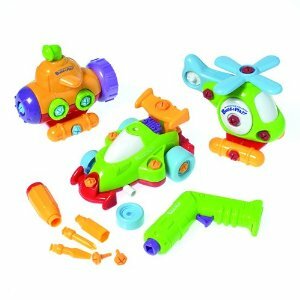 It comes with three vehicles that the little ones can take apart and put back together. It uses a battery powered screwdriver, and once together, each toy has a moving part. Well made & not overpriced at $24, I think 4-8 is a good age range for it. Another toy that we've enjoyed is called Inchimals. 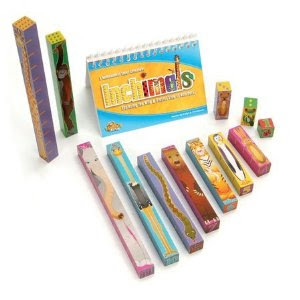 These are colorfully painted animal blocks that double as measuring sticks, from 12 inches down to 1. They come with a dry-erase book in which you can use the inchimals to do math problems. Warning, your kids will start to say strange things. When baby Camille was over at our house, Alex said to me-- She's so tiny, I bet she's just one giraffe. So we had to measure her, and it turns out she was a giraffe plus a bear. 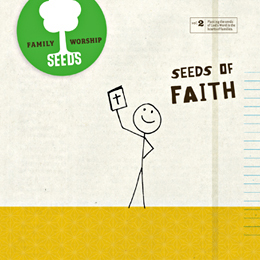 I also still really, really love the Seeds Family Worship CDs. Bible verses set to music, and not annoying. This link is to their website, but I think you can also find their CDs on Amazon. One of my favorite things we got the kids started on was listening to stories on CD during quiet time and on road trips. They've really liked the Frog &Toad audio books, Winnie the Pooh, and Veggie Tales stories. So audio books and maybe a CD player would make a good gift. What I have not yet told my husband, because he is often unavailable for consultation (some excuse about a war or something), is that I just bought the complete CD collection of Dan & Louie stories for this year's Christmas. And they might have been a little pricey. This is a blast from the past from my own childhood. Dan and his puppet Louie tell Bible stories and sing songs, and it may not surprise you that I can still sing some of those songs today. After all, I have a memory devoted to useless trivia but it refuses to hold onto key information like where I put my keys or phone. In defense of the cost, there are 20 CDs in the collection, and over 24 hours worth of stories. And they are coming soon to a doorstep near you me. Looking for a good game for the mini mathlete in your family? I'm going to get this for Alex. A friend had it, and it helped her kiddo learn his addition math facts in a fun way. 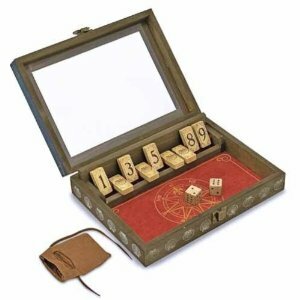 It's called Shut the Box. So there you have a few ideas, I'll share some more if I think of any. If you have a gift idea that your family really enjoys, feel free to share it in the comments so we can all check it out. Now I have to tell you that everything written above this line, I wrote earlier today. I wanted to proofread the post before I published it, but I needed to go get the kids and myself ready for a movie date with Peepaw (my dad). And wouldn't you know that after writing that, as we were getting ready to leave for the movies, I could not find my keys. Like, really couldn't find them. It took 3 adults looking for 40 minutes to find my keys. And I only found them AFTER Mark searched through bags of garbage on my behalf. Guess they weren't thrown away after all, Mark. Are you glad we're staying at your house, Mark? But the kids and I made it to the movie. We saw Arthur Christmas and then spent some time releasing pent-up energy in the McDonald's playland. Which means it is now disinfection time. AKA bathtime. If you're not spending all those deployment entitlements as he earns them, you're not doing your job. Oh - tried to slip this one past me by immediately posting another so I might miss this did you? Say that again please. You threw your keys in the trash? I wonder who has suffered the slings and arrows of your wit for accidentally having things end up in the trash? Delightedly awaiting your return.